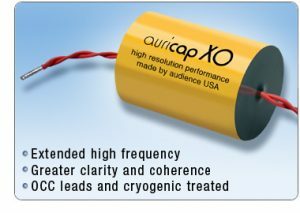 Auricap XO precision wound high resolution metalized polypropylene capacitors, made by Audience U.S.A. Specializing in OEM service for the finest designs. Auricap XO is a new high performance capacitor product from Audience that is the result of rigorous consideration of every aspect in capacitor design and the manufacturing process. Audience has reconsidered a host of parameters including tension windings, baking times and cryogenic treatment among other proprietary procedures. Auricap XO is made using the very finest obtainable polypropylene film and new high purity continuous cast copper leads. This new capacitor design offers reduced parasitic such as ESR improving on its effective bandwidth, clarity and coherence. With these design changes a new level of performance is reached with even less coloration, micro-phonics and noise contribution than the famous Auricap. There are no drawbacks to the Auricap XO in comparison to the standard Auricap. Users can still expect all of the wonderful virtues for which the standard Auricap is known. In brief, the Auricap XO is simply more transparent allowing you to hear farther into the music.